Fine art , which for me then became tattoos has always been a part of my life and in the summer of 2010, I managed to get my own studio in Arboga up and running! I ran it myself for a little more than two years. I won a prize from the Savings Bank and also the Winnet Arbogas Challenger of the Year in 2010. I held a few lectures at schools telling kids how I had gone about starting my own business, and to follow ones dreams. I have also done other art assignments like logos and ​​murals for schools. However I grew out of Arboga. My next goal was to rent a chair at another studio in a major city! In December 2012 , I started working in Örebro at Elite Artwork! So now after a little more than 5 years in Örebro I felt ready for a new adventure. I am very happy for my time at Elite Artwork, but sometimes one needs a change of scenery to kick of new inspiration. I have been going around guest working some which has given me the opportunity to choose where I would like to go next. So in december 2017 I accepted a request to start working at Crooked Moon Tattoo in Helsingborg. It feels great since Jacob Pedersen who owns the studio has been a big inspiration of mine ever since I opened my studio in Arboga. It will be exciting to see where this will take me. 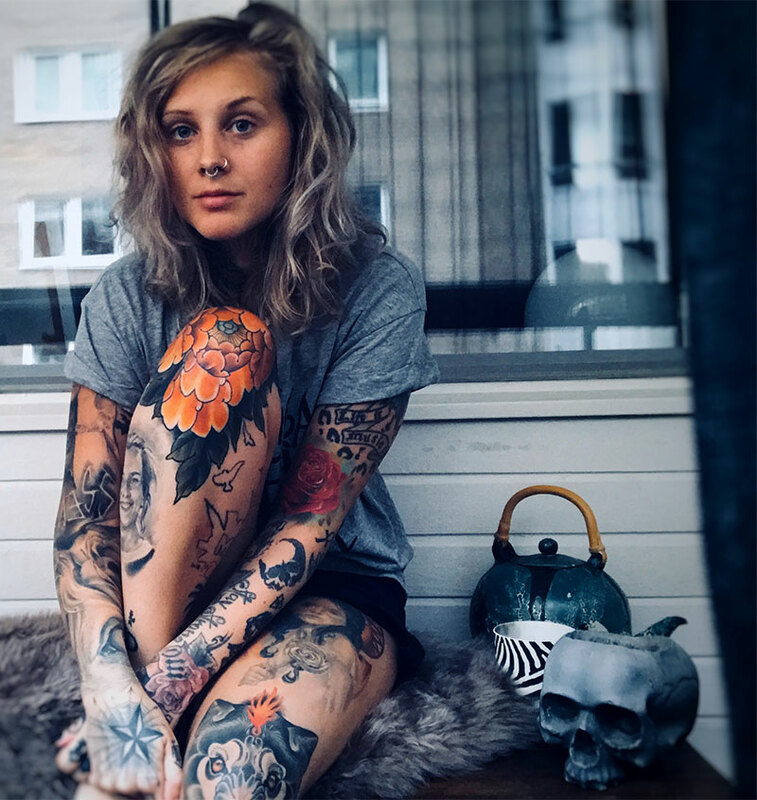 2018 Start working at Crooked Moon Tattoo in Helsingborg. 2017 Guestworking at Lifestyle Tattoo Södermalm monthly. 2016 Convention in Örebro i october. 2016 Convention in Huskvarna i october. 2016 Convention in Nepal in april. 2015 Convention in Motala (won 1st prize for realism). 2014 Tattooed at Huskvarna Rock & Art (won 2nd prize Childrens Choice). 2013 Tattooconference in Boston and study visit in New York. 2012 Started working at Elite Artwork. 2012 Tattooed at Arte Ink convention in Västerås. 2012 Had my own exchibition. 2011 Cover of Les Affaires Magazine. 2010 Winner of "Challenger of the Year" in Arboga. 2010 Winner of Young Entrepreneur. 2010 Chosen for Board of Directors at Winnet Arboga, society for female entrepreneurs. 2010 Lecture at school on entrepreneurship and to follow ones dreams. 2010 Open Arboga's first and only studio at the age of 19.